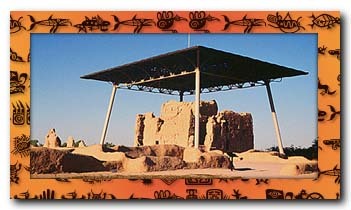 The Hohokam peoples occupied a wide area of south-central Arizona from roughly Flagstaff south to the Mexican border. They are thought to have originally migrated north out of Mexico around 300 BC to become the most skillful irrigation farmers the Southwest ever knew. The ingenious Hohokam developed an elaborate irrigation network using only stone instruments and organized labor. Before modern development obliterated this system, their predecessors commonly referred to them as the Canal Builders. The Hohokam were creative artisans who became famous for their intricate work with shells obtained from the Gulf of California and the Pacific coast. They created a coiled pottery finished with a paddle and painted with red designs. They retained a great deal of Mesoamerican influence as can be seen in their use of ball courts and decorative feathers. They also became entrepreneurs in a thriving trade with their neighbors, the Anasazi and the Mogollon. Their fate is unclear, but they seem to have disappeared from the archeological record between the first half of the 15th century and the time when the Spanish first came upon their descendents, Pima-speaking Indians still using the ancient irrigation techniques. Some of their original irrigation canals are still being used in the Phoenix area today!